I often create GIFs from a consecutive sequence of transparent PNGs (exported from a 3D modeling app). I find the workflow to be a bit long and tedious. Are there any other faster ways to turn a series of transparent PNGs into a transparent GIF? Joojaa is right. It is simple to do with open-source software on Mac and Linux and Windows, if you are not afraid of the command line, because you’ll need to use the terminal. On Linux use your package manager, or on Windows download from the graphicsmagick website. https://github.com/doakey3/Bligify is a Blender addon for exporting animated GIFs. I used it a few months ago for a one of project and it worked perfectly. https://www.youtube.com/watch?v=eCdI6hfqsK8&feature=youtu.be shows it it action. You can import directly the PNG sequence as video in the most recent versions of photoshop. You select the first file of the sequence. Make sure they have the same name followed by a number in order to Photoshop understand it as a sequence. Make sure it was imported as a sequence taking a look in the Timeline Panel. OPTIONAL: You could want to have more control (about order or time) over the individual frames in the timeline. In order to achive it you need to go to the Timeline Panel options Convert Frames / Convert to Frame Animation and edit accordingly in the timeline. Make sure the format is GIF and that the looping options are as you wish. (most of the time you would want it in the 'forever' setting. Or you can use an online generator like this to do the trick. save as web is best as I know. Normally online converter tool so fast that I am using. Not the answer you're looking for? 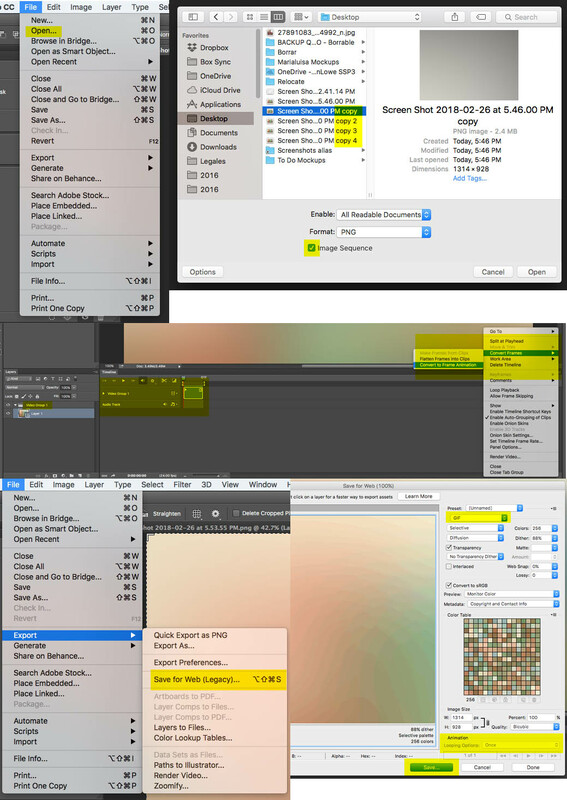 Browse other questions tagged adobe-photoshop animation workflow gif adobe-after-effects or ask your own question.